Peace Starter Meditation Relax is an app, available on Android, which goes some way to reminding app users to relax and to seek inner peace and harmony. Fast-paced living and the constant need “to do” may appear to be the norm but it is also wearing and stress-inducing, having a negative impact on one’s wellbeing. The constant rushing around means that many feel disconnected from their inner being, mainly because their focus is always on the external rather than focusing inward to seek that true peace and harmony. Peace Starter Meditation Relax provides numerous tools that help you unwind. Depending on your state of mind, Peace Starter Meditation Relax gives you what you require to reach a state of equilibrium, using attractive images and sounds to help in this sensory and auditory experience. If you are feeling overwhelmed by negative thoughts, Universe Meditation – Positive Affirmation provides affirmations to help you clear your head of any negativity. While Daily Wisdom quotes assist with motivation and seeing things in a new light, which can support you on your spiritual journey. For those that connect more with sounds, there’s Pure Nature Sounds to encourage a peaceful state of mind in which to meditate. While binaural beats can help induce relaxation, sleep or boost your creativity. Peace Starter Meditation Relax is a useful app for those wanting to learn to meditate or simply relax. It may not be the most visually enticing app – messages and daily wisdom are displayed in a very simple font within a simplistic design, using standard graphics, but that is not where the beauty of this app lies. Peace Starter Meditation Relax app is content rich and has something for everyone to help them on their journey towards inner peace. 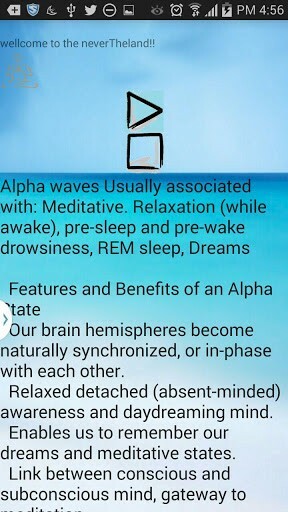 The combination of tools means that this app can be used throughout the day no matter what state of mind you seek – be it to aid sleep, be it to enhance creativity, to energize or to assist with meditation. The only downside with this app is the ads which for some may defeat from the purpose of relaxation and cutting-off from all interferences and influences. Currently there is no ad-free version, but if you can get around the fact that Peace Starter Meditation Relax app has pop ups, the resources are tireless.